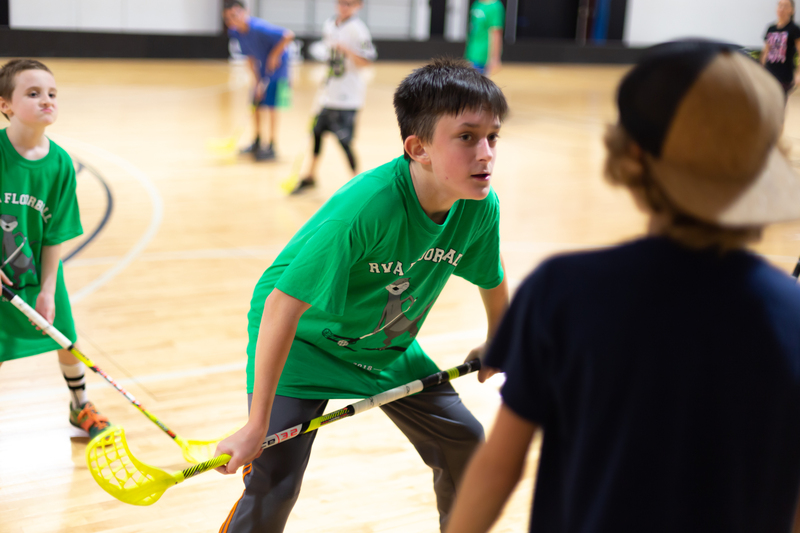 Getting started with RVA Floorball is as simple as signing our waiver when you register online and collecting a few essential items for gameplay. At RVA Floorball we require everyone to wear running shoes. We would like to recommend running shorts, a breathable shirt, and tall socks to protect your shins. We also suggest bringing a small towel and a water bottle, because hydration is so important. We do have a water fountain, bathrooms, and sticks available for our guest to use. Parents are always welcome to stay and watch their child play, we will have seats available in the gym. We also have a nice waiting area available, that has a vending machine and a tv for entertainment while you wait. If you are bringing a younger child to play, we encourage you to be here at least 15 minutes prior to game time to check them in. Older children who drive or would like to come with friends are welcome to check in on their own.